Although rosé wines are quite tasty all year round, summer is high season for all things chilled and pink. 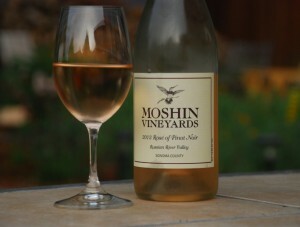 Backyard hangin’, patio pleasin’, light summer food pairin’ rosés are custom-made for thirst quenching. It only makes it better that they’re affordable too — with most weighing in between $10-$25. I’ve been exploring the California dry rosé scene this year… finding everything from Pinot Noir-based to Carignane to Grenache. Most have aromatic strawberry, luscious raspberry, tart cherry, (sometimes) watermelon with a squirt of lemon. All are refreshing, dry, sophisticated, with salavacious acid levels for sipping or drinking with food. Pair rosé wines with all sorts of cheeses, like a simple goat chévre, or watermelon salad, grilled chicken or… hell, like sparkling wine, these wines play well with pretty much anything. Even ribeye. Seriously. Depending on where you live, most of these might not be available through your local retailer. However, since the price is pretty low, it might be worth having them delivered to your door directly through the wineries’ websites. If you’re looking for other rosé wines, dry or sweet, to try, take a look at the alcohol level listed on the label (by law). A good rule of thumb is that a dry wine will have about 13% alcohol or more. Less than 13% could indicate a sweeter sip. Moshin Vineyards 2013 Rosé of Pinot Noir, Russian River Valley, $22. Moshin website. Navarro Vineyards 2013 Rosé of Pinot Noir, Anderson Valley, $19.50. Navarro website. Crux 2013 Grenache/Syrah/Mourvedre Rosé, Russian River Valley, $20. Crux website. Lioco 2013 “Indica” Rose of Carignan, Mendocino County, $18. Lioco website. Van Duzer 2013 Rosé of Pinot Noir, Willamette Valley, $18. Van Duzer website.